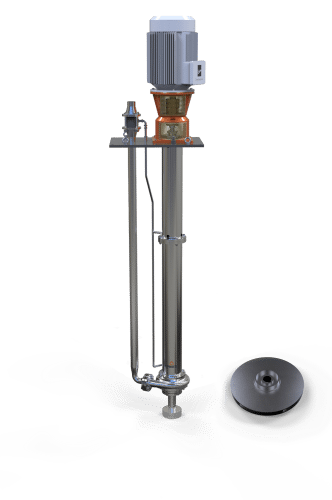 The VS4 type, KPDS is sump pump suspended vertically into the sump and mounted at support plate level for process application. 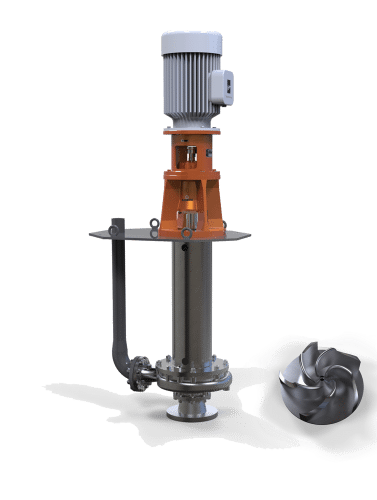 KPDS are pumps with both variance of enclosed impeller and KPDS QF with mixed flow type impeller. KPDS pumps have wide range of application in various chemical process industries for pit depth up to 5.5 meter depending on liquid handled. 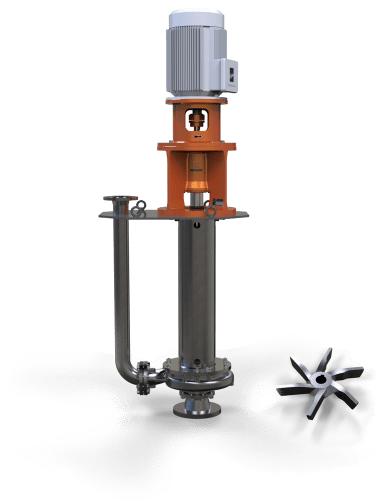 The VS4 type, SHS is vertical non-clog pumps for wet pit applications. 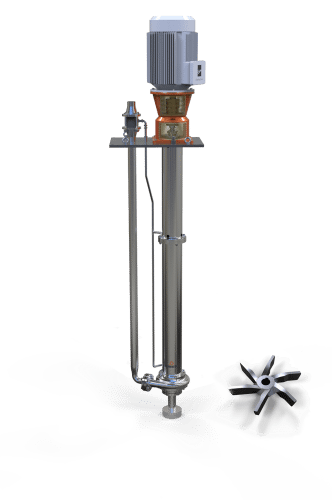 The pump unit is suspended by a column pipe which also protects the transmission shaft. 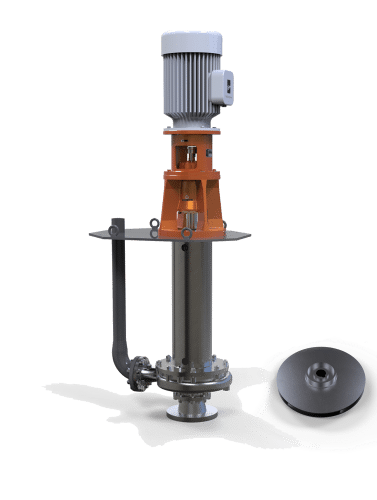 These pumps can be offered with a column length up to 6.5 m. These pumps operate at 50 Hz. Casing: The casing is volute type, radially split pump. Smooth hydraulic passages ensure high efficiency. Impeller: The impellers are of enclosed type (KPDS model) and semi-open (KPDS QF models) impellers can also be supplied. 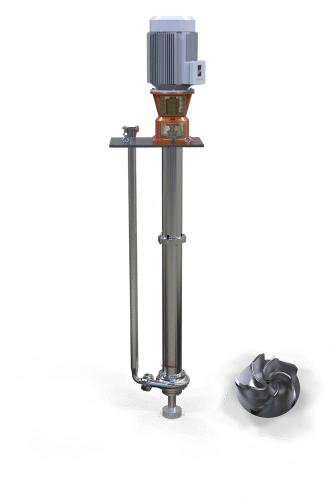 Hydraulic balancing of impellers is achieved either by back vanes or by balancing holes. The impellers are statically and dynamically balanced. Reliable fixing of the impeller on shaft is achieved by using Heli coil insert under impeller nut. Require very less floor space. Priming not required. Support Plate can be offered in rectangular or round support shape to fit site requirements. Support Plate can be fabricated with dimensions to suit customer requirement. Lubrication for Bearing Bushes – Self water or External lubrication possible. Bearing Bush Lubrication – Grease/External Water. Available in variety of flange drilling Standards – Standard scope of supply DIN 2533 ND16. Positive locking of Impeller on Shaft with the help of Helicoil Insert. Intermediate shaft bearing is rubber (For water Lubrication) and bronze bearing (For grease lubrication). Thrust ball bearing in combination with metallic journal bearing at head shaft. Transmission bearings are lubricated with external clear water or grease. Thrust bearings are grease lubricated. Direction of Rotation: Clockwise viewed from driving end. Drive: Pumps can be driven by electric motor or engine.